Think of this recipe from Worth Her Salt as Southern-style ceviche. Shrimp are marinated–essentially pickled–in a tart, citrusy brine with garlic, onions, spices and a thick layer of olive oil. If you’re one of those people who like to drink pickle brine like I am, you’ll love sipping from this jar in front of the fridge late at night. 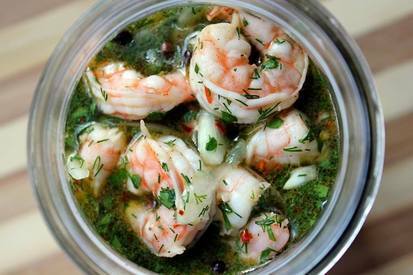 Serve it just as you would any other cold shrimp appetizer, maybe with crackers or toasted bread to sop up some juice. These are also great on salads, or as a tart addition to creamy potato salad. Or, just eat them straight from the jar.